Last month Matisyahu and Miri Ben Ari joined YJP and the Chabad Loft for the Mumbai “Chanukah: Light Up The Night” Benefit (which you could read about here). In the spirit of responding to crisis with events that bring together people through music, speaking, and raising money for charity, YJP is hosting another such event, and this time for Israel. The event will host Alan Dershowitz, Y-Love, Diwon and the world famous rock star, Perry Farrell. To check out photos and video from the last event, click here. This will be another black tie benefit “NYC with Israel” in solidarity with our brothers and sisters in Israel who are going through difficult and turbulent times. Larry Silverstein is graciously giving us his gleaming skyscraper for the evening which will be held on the 45th floor. 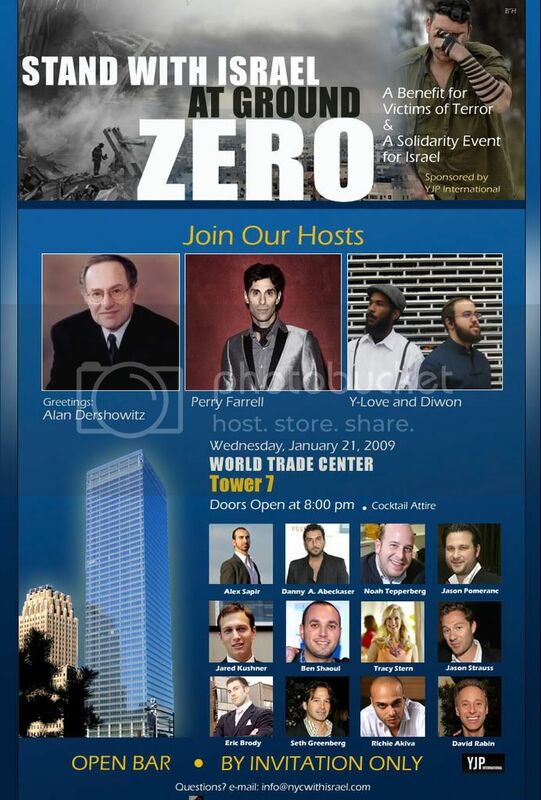 Held at 7 World Trade Center, the event is a benefit, with all proceeds earmarked to support victims of terror. This will be a low ticket party, focused more on generating good will and attention: Stand with Israel. What better place to rally against terror than ground zero?